When Paonia’s Paradise Theatre mostly closed and went up for sale in 2013 the community realized more was at risk than another local business trying to survive tough times. Various conversations about buying and reopening the theater kept running into economic reality, the theater was outdated, its projection technology was obsolete, and the real estate itself was not cheap, at a time when there were quite a few vacant storefronts along Grand Avenue. The situation looked dire. Today’s Paradise Theatre looks much the same as it always has. Since debuting its first feature “What Price Glory” in October, 1928 the Paonia Theatre–anchoring the main business strip–has always been a cultural hub in this small, isolated western Colorado town. When the theater opened, Colorado had about 1 million residents, with most living then (as now) in the towns and cities along the Front Range; in the 1930 U.S. Census, Paonia reported 958 residents, Hotchkiss 541, and Crawford 157. In October 1928, President Herbert Hoover was well on his way to a blowout victory in the state and in the nation’s Electoral College. The nation was unaware, of course, that it was about to be plunged into two decades of financial ruin and world war. But through the tough times and good, the Paradise (nee Paonia) Theatre has served as a center of community. In the years just after its founding, during the years of Prohibition and through the toughest times of the Great Depression, the theater not only served the town in its more mundane though vital role as a movie house, but also as a hub for illegal alcohol manufacture, consumption and distribution, according to local lore. The Paonia-Paradise Theatre has always been an anchor of the downtown business community. 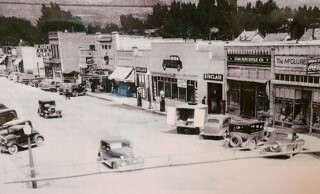 Then as now Paonia was also a town with lots of churches, and during Prohibition, as in the decades since, the theater always stood as a pillar in the community–holding fundraisers, promoting events, sharing its space, and providing a place for people to gather and learn the latest news, rumor, and gossip. As well as showing movies, holding dance parties and allegedly distilling and selling spirits, [founder Tom] Poulos was a community minded man and sponsored events for school pupils of the North Fork Valley. At one point he estimated that 1000 guests were in attendance. There is mention in The Paonian [newspaper] that he donated three evenings of programming to the Community Chest. He hosted Santa Claus on Christmas Eve and invited all the children from surrounding towns. A Fireman’s Ball, a free band concert and movie, a benefit for the Paonia Library were all testaments to his civic responsibility and community spirit. 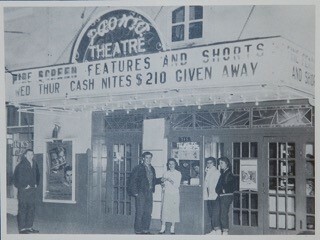 Poulos sold the theater in 1969, to the Bear family, and longtime valley resident Lynne Bear recalls how local hippies, who were beginning to arrive in western Colorado around that time, helped to renovate the theater. “There must have been 20 or 30 hippies and they did a good job,” Ms. Bear recalled in a recent interview. America was going through big social changes in the 1960s and 1970s. The ‘hippies’ weren’t all just passing through, and some began to settle down, adapting the 80-year tradition of small family farms and ranches in the North Fork, with emerging ideas around ‘permaculture’ and organic farming. Of course a lot of it wasn’t new to the families in the valley, and over time people learned to mostly get along through shared endeavor. Over time a musical, artist, and artisan community began to flourish as well, but one that even now remains rooted in the economic and life reality for many in the North Fork: they are also ranchers and farmers, miners and rural people use to scraping by, pitching in, and sharing effort to get things done. So as the North Fork became renown, as a quirky center for a creative and musical community; as a hot bed for organic farming, quality drink, meat and dairy; and, yet still as a traditional-minded, coalmining town, the Paradise Theatre has hosted plays, fashion shows, and musical acts of every sort—like long-time valley resident, the legendary (and regrettably late) Joe Cocker (who joined Otis Taylor on stage) to an increasing number of far flung and notable acts such as Lake Street Dive, Darrell Scott, Martin Sexton, David Lindley, the March Fourth Marching Band, and Peter Rowan. They all want to come see what this remarkable little valley is about and they never leave disappointed. Paonia’s original theater, the Gayety, burned down in 1926 or 1927. 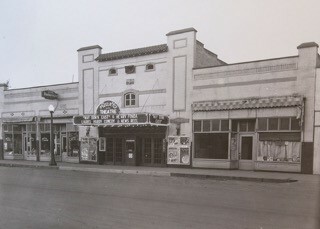 The Paonia became the Paradise Theatre under the ownership of Danny Perkins, who acquired it in 1991. It passed through several more owners until bought by Raven Heart in 2010, and went back up for sale in 2013. 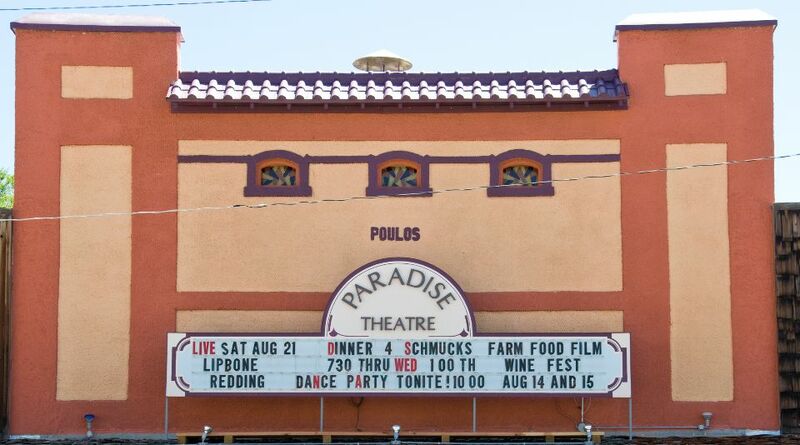 Throughout most of the history of European settlement in the valley—from its first orchardists and coalminers, through the arrival of hippies, artists, and new entrepreneurs, the Paradise Theatre has served an unique and critical role. Indeed, when it first opened in 1928 it was already filling a need–as an earlier, and popular, venture the Gayety Theater had previously burned down in a fire. So in 2013, with the theater mostly shut down, neighboring downtown establishments were beginning to feel the effects of losing the ‘dinner and a movie’ crowd. People were not as inclined to explore the downtown area without the option of seeing the latest film, a visiting band, or community event. Legendary musician–the late, loved, long time local–Joe Cocker performs onstage at the Paradise Theatre. Photo by Jim Brett. Thus it was a momentous thing later that year when the Paonia Chamber of Commerce agreed to sign the lease from the previous owners. It was the hope of many that the theater become a direct community asset, that a shared effort could float it through the tough times and keep it a hub to strengthen the town, businesses, and economy along the way. With this idea in mind, a small group of devoted citizens, now known as the Friends of the Paradise Theatre, took charge and began meeting regularly to develop a business model and structure for the theatre and a non-profit organization to manage and guide it. After receiving help from four anonymous lenders, they put in a low but market-bearing offer, and a three year payment plan including a low interest rate was settled. During this time, the Chamber’s support was absolutely critical in keeping the momentum alive, and things quickly began to take off. Another multi-purpose community venue, the Paradise Theatre in Paonia has served as a movie house, stage for live theater and community gathering place for more than eighty years. But what makes the Paradise truly special to North Fork Valley residents is its emphasis not just on blockbuster films, but on smaller, independent features, which are shown during the Cabin Fever Film Series, a part of the programming here for two decades. Through online crowd-funding and local charity events, the theater was able to raise more than $43,000 to put toward digital conversion. The Kickstarter campaign also lived up to its name, and excitement spread about the Paradise’s intent to become a community driven, non-profit organization. Donors mailed in checks and stuffed money into organizer’s pockets as they passed them on the streets. Over $100,000 was raised in a mere 45 days! This was huge, above and beyond what anyone was expecting! The Paradise had raised enough money to purchase new equipment, remodel the building, and launch its business endeavors in what seemed like the blink of an eye. Community members volunteered their time to rip out the old and put up the new. Fresh coats of paint were carefully brushed onto each wall, and within 6 weeks, the renovation was complete. To celebrate this community effort, the Paradise held a screening of the film, Cinema Paradiso, the Italian film after which the theatre was named. Seats were packed and thanks to the Paradise’s newly obtained liquor license, beer was flowing. That summer evening and everything leading up to it, reinforced the value of community and the Paradise Theatre. It was destined to be. The Paradise Theatre is committed to elevating community culture through diverse, quality art and entertainment in the form of film, live performances, music and special community events. Our pursuit is to inspire the appreciation of the arts and community through a constructive and comfortable venue. We are dedicated to fostering creativity, ingenuity and the exchange of ideas and talents between people of all ages and personality. Since the Paradise Theatre’s reopening in June of 2014, a community forum was held. People expressed their desire for both youth and adult film education programs. The Paradise took the community’s opinion to heart and plans to focus on offering filmmaking workshops throughout the year. 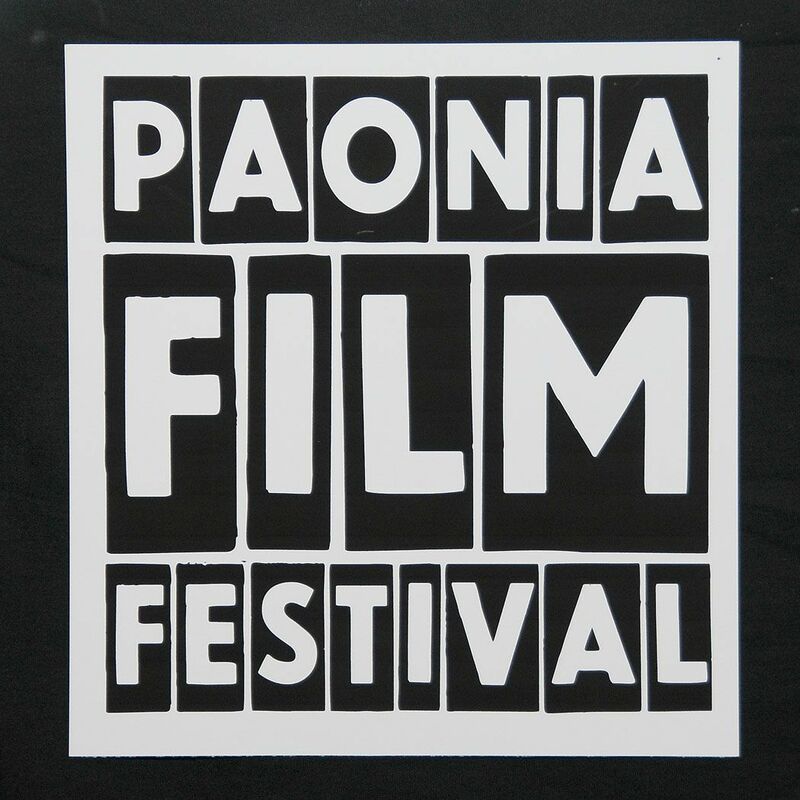 Proceeds from these workshops will help support the return of the Paonia Film Festival in 2016, and allow the Paradise to continue to provide the highest quality film, art , music and instruction to the North Fork Valley and beyond. So far 2015 is off to a great start with the blockbuster movies The Hobbit: Battle of Five Armies and the Theory of Everything, and several installments of the Cabin Fever Film Series, filling the cinematic bill, and a full schedule of events, plays, shows and more for the year ahead. The theater itself—the building—was just approved as a historic landmark by the Delta County Historic Landmark Board, and should soon be officially recognized by the County. (Props to Tom Stevens!). The Paradise Theatre gives people a sense of ownership because of the amount of input there is over programing, the ability to rent the theatre, the social gatherings, community events, and because of the effort everyone made to ensure it remained an icon in the North Fork Valley. It would not be what it is today without the people and place it serves. For most of the life of this small western Colorado town, Paonia’s Paradise has stood for the resilience of community and as testament to time. Article written by Pete Kolbenschlag and Courtney Mullin, with Mountain West Strategies. Historical accounts from information compiled by Tom Stevens, for application on the Delta County Historical Register, through interviews with Amy DeLuca, the Paradise’s Program Director, and compiled by the authors. Pete Kolbenschlag also serves as a member of the board of directors of the Friends of the Paradise Theatre.